This was my life a year ago. It was my first holiday season with a baby girl I desired for years. I remember fighting tears and thinking about the irony of it all. I’d waited months for this time and now all I wanted was sleep. I’d felt her kick in my belly and longed to see her face, and then wondered how such a tiny thing could scream with such force. Before leaving the hospital, the nurse told us not to bring her into crowds for a month. Continue over to Abby McDonald’s place and join us for the #RaRaLinkup! With Christmas down, this is the time of year we move our hearts away from awe and wonder and drive them straight into strategy and planning. I have got to lose 10 pounds. I am going to “kill it” at work. I will set up that savings plan starting this year. I will be a more loving mom. I will start eating more healthy. I will find a new job. I will get that graduate degree. ​I will make more friends. We become resolute to be resolute. We plan to make a plan. We. Will. Make. It. Happen. Is the Lord building your house or are you? With God, we press on. With God, we find strength. With God, he renews hope. With God, we find fresh encouragement. With God, we get a helping hand. With God, he speaks truth and humility. With God, he refocuses us in love. With God, he redirects our paths, as he holds our hand, so that we don’t end up falling over the cliff of failure. Instead, he grabs us and leads us where he wants us to go – and we feel okay with it. It make sense, for he is the leader. It makes sense, because sometimes he is more concerned with our spiritual than our physical. Are your plans to go – with God – or are they with an insatiable drive to succeed, win and to thrive? Get all Purposeful Faith blog posts by email – click here for easy subscribe! Join Kelly on Twitter and on Facebook. Christmas is here, but so is family tensions. Christmas is here, but so are dysfunctional relationships. Christmas is here, but so are old habits. Christmas is here, but gone are people we love. Christmas is here, but baggage of old still exists. Christmas is here, but fears surface. What looks unscalable, God boosts you over. What seems unbearable, God brings you through unbelievably. What can’t be managed, God says let down your guard and I will guard you. Will you throw your cares upon God’s shoulders? He is the only one that can hold the weight of them without breaking his back. As you cast it over, God gets under its crushing weight (just like he did at the cross). The weight is no longer on you, so when you walk, talk, eat or digest other’s insults, you don’t fall. You are preserved, whole and entire. Press in and God will press his being through you. Cast your cares and he will care for you. 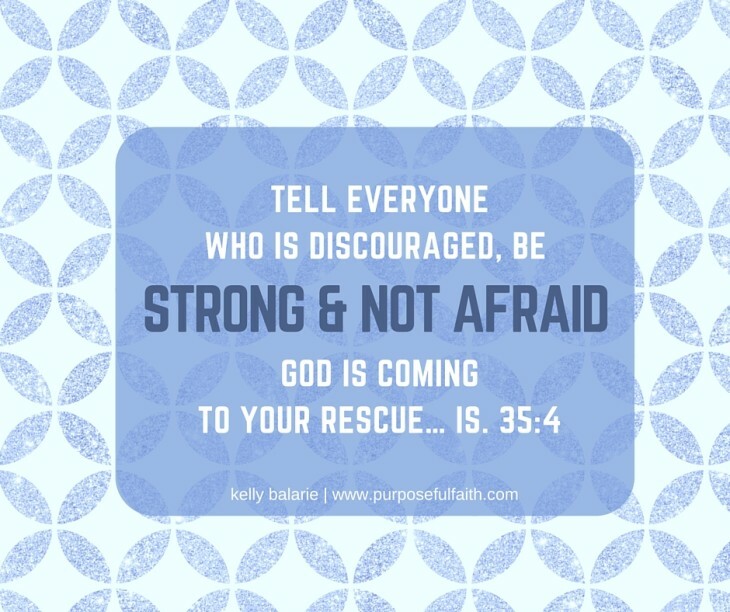 Be strong and trust – God is about ready to rescue you! 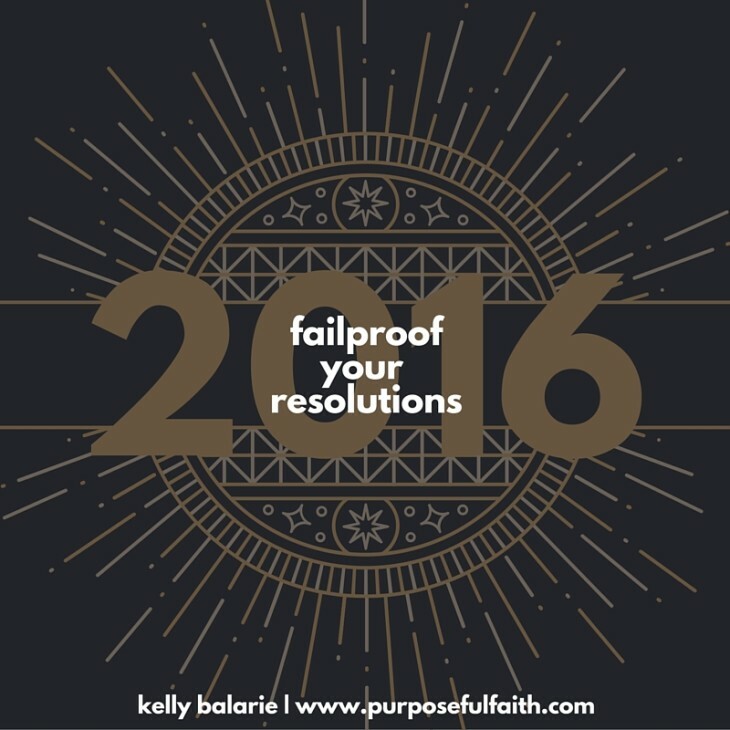 Get all Purposeful Faith blog posts – click here for easy subscribe. People are laughing and hugging as they reunite. Talking about the year past. Listening to a story repeated for the one-millionth time. Drinking egg nog or sparkling apple cider. while, inside, feeling anything but jolly. Sure, they may be singing “Joy to the World,” but their true emotions are joyless. They may give you the highlight reel of the year past, but they leave out the drama. They may be busy with buying, cooking and wrapping, while having a world of marriage, finances or health crashing down. They may be proclaiming “Happy Holidays,” only to be deeply grieving those they love. God with us in the thick of pain. God with us in the thin of finances. God with us when we feel happy – or sad. God with us despite how much others are. Will our hurting family members get a chance to know “God with us”? How he draws near to the down, dejected and devastated? Or will they believe that facades of merry and bright are the only outfits allowed? They have to see how “God in us” has worked life – through us. Are you willing to step outside of comfortable to bow down, worship and treasure the small baby – in both word and in action – this Christmas? Will you make known the cries that moved from a manger to a cross to change everything? Lighting up Christmas, is not about lighting up a tree. It is about lighting up our loved ones with the treasure we have in Jesus Christ. It is about lighting what truly matters. When we light Jesus, we light love. What shines is the one thing that matters most, the one thing that people need and the one thing ready to light the world. 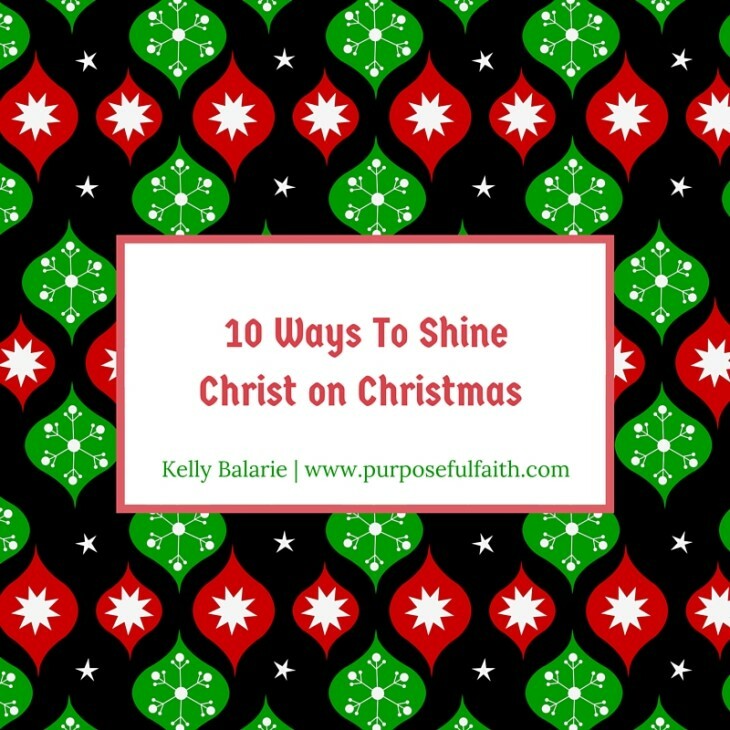 So how do we shine Christ on Christmas? 1. We make his purpose higher than our cause of opening gifts. 2. We are more concerned with sharing Jesus than sharing mashed potatoes. 3. We go to vulnerable places, so hurt ones know it is okay to go there too. 4. We seek to touch a person’s real need, not just their need to be entertained. 5. We seek the quiet of the Lord, so that we can enter into the mayhem of family – with peace. 6. We sit and listen, verses boast, toast and gloat over things in our own lives. 7. We look to serve and honor others above ourself. 8. We pray to discern who the Lord might direct us to. 9. We discuss the Christmas story. 10. We speak about the Savior who saves. BONUS: We take a risk, even when the risk makes us think others won’t like us. 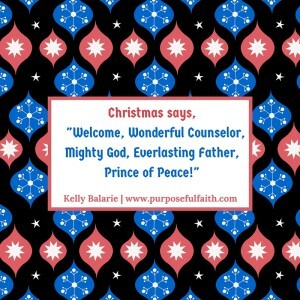 And those around us will get a chance to know the God who goes with us – Wonderful Counselor, Mighty God, Everlasting Father, Prince of Peace (Is. 9:6). And, the small beginnings of Jesus’ new beginnings will shine. They will shine all-consuming love that touches our houses and hearts with true and long-lasting “merry and bright”. My friend walked through the grocery store with her eyes down and shoulders slumped. She was having a hard day and it showed. My friend felt like the woman’s question, laced with pity, was suggesting that it was not Christlike to be struggling. Listen, we all have hard days and hard seasons. It would be a lie to answer with an, “I’m fine” during those times. 1. The other person won’t care. 2. They won’t know what to do with our hurt. 3. They don’t seem like a safe place to share. 4. We don’t want to burden them or overshadow their happiness. But life is plain hard sometimes and we need one another to stand up when the waves of circumstance threaten to capsize us. Just the other day several friends and I were swapping some good news. One of our friends bravely admitted that she was struggling with bouts of sickness with her kids, but she didn’t want to rain on everyone’s parade. She definitely shared in our happiness yet, instead of saying, “I’m fine too”, she was honest with how she felt. I was grateful for her authenticity, it actually strengthened our friendship—knowing that she wouldn’t lie or put up a front that everything was okay when it wasn’t. Just because you are struggling to find joy does not make you a weak Christian. Look at all the biblical greats who struggled with various things like unbelief, temptation, jealousy, fear, anger, etc. 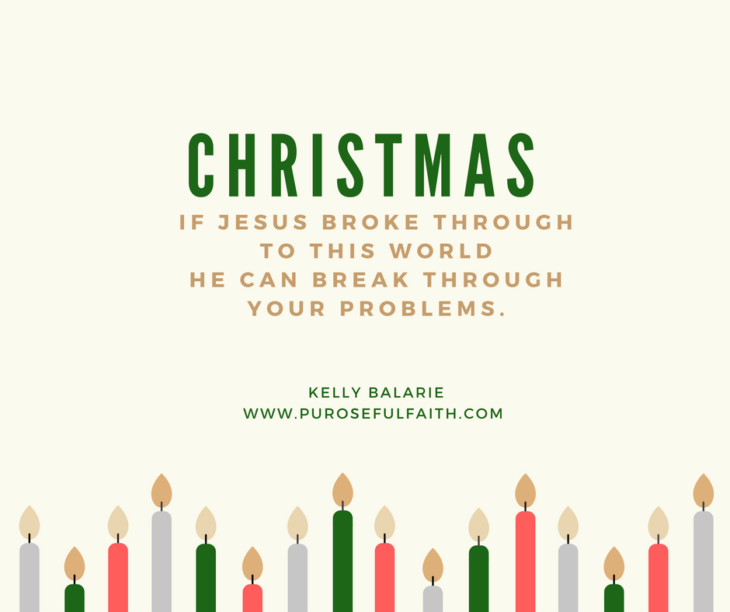 Sure, Christ wants us to have victory and count it all joy, (see James 1:2-4) but that doesn’t mean we have to put on a Pollyanna plastic smile and pretend that everything is okay, when it’s not. The holiday season can fill us with moments of wonder and worship yet also remind us of loss and pain. 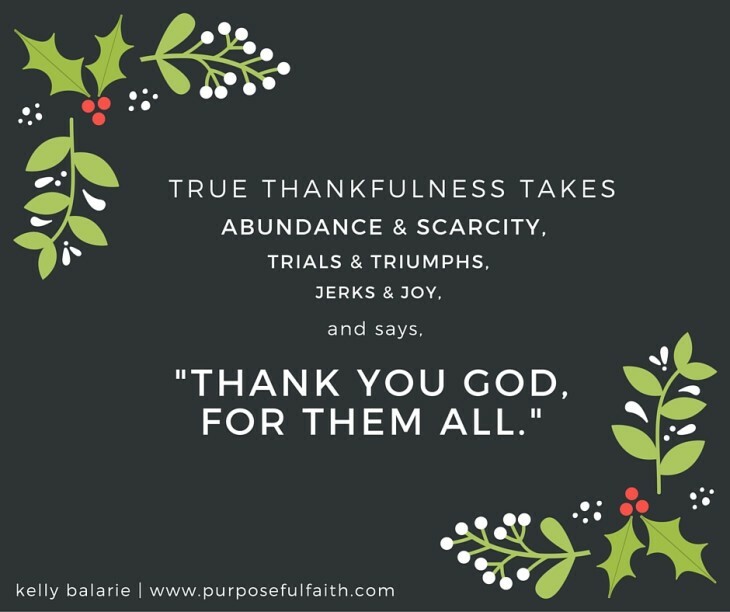 It’s as if our senses are more acutely aware of both our blessings and brokenness this time of year. Think of the conflicting emotions felt during that first Christmas season long ago. 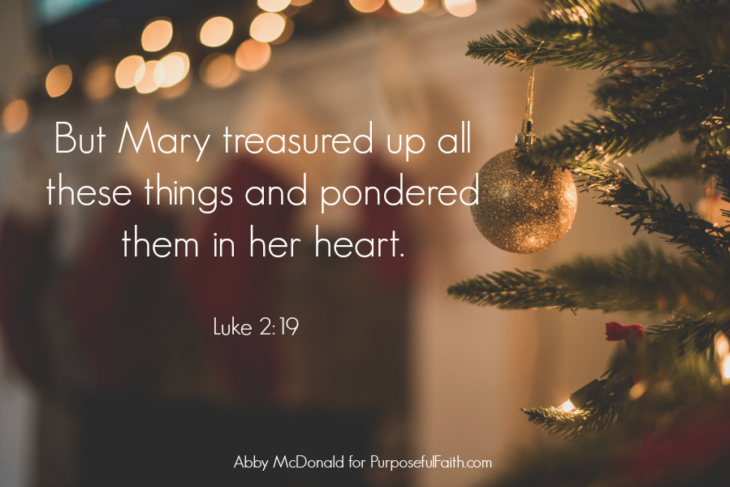 I am sure that Mary experienced the loss of her reputation when the naysayers discovered that she was pregnant. Then, months later—great with child—she rode on a donkey, not in comfort but on a bumpy journey away from home. Yet, in her struggle with pain, she was carrying the Good News, the long awaited One, who would bring lasting hope to a hurting world. Even in the dark there is light. There is hope in the struggle, but that doesn’t minimize our pain. 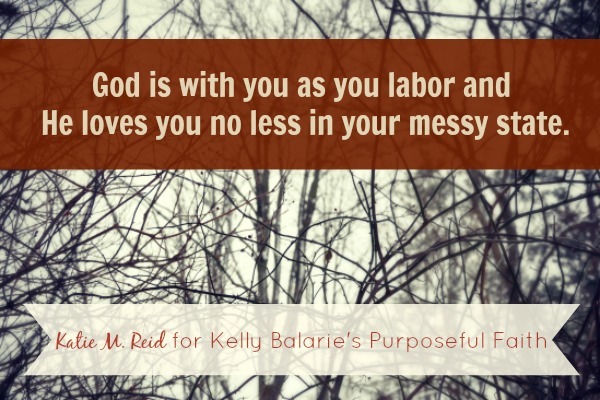 God was with her as she labored and He loved her no less in her messy state. The Good News should cause us to rise up and celebrate but that does not mean we have to be super-human or deceitful and pretend that nothing discourages us. The super-human Savior, both God and man, came to us in our struggling state and loved us so much that He took on more pain that we will ever experience. Whether you are struggling or soaring this season, know that you have an empathetic Emmanuel who is with you and for you. He doesn’t scold you in the shopping aisle, He nods with understanding as you unwrap your feelings and let Him in—even to those untidy corners of your heart. Thank You Jesus that You love us so well. Even when we are falling apart You hold us together with Your strong arm. You are the Hope of the Ages. Help us to rest in Your embrace and to live bravely, whether we are happy or sad. Thank You that You are patient with us—not condescending. Oh how we need you, this day and for all time. Lift up our heads and may we magnify You—the One laid in manger, killed on cross and resurrected in victory. You are the best gift of all. Amen. Katie M. Reid is a tightly wound woman, of the recovering perfectionist variety, who fumbles to receive and extend grace in everyday moments. 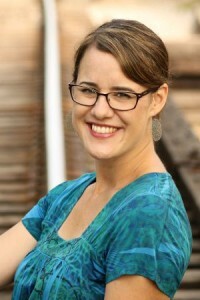 She delights in her hubby, four children (and one on the way) and their life in ministry. Through her writing, singing, speaking and photography she encourages others to find grace in the unraveling of life. 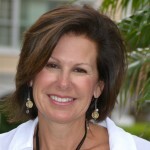 Connect with Katie at katiemreid.com. It was the week before Christmas and I was feeling the stress, instead of Christmas, I felt more like Chris-mess. Yes, I was knee-deep in wrapping paper strewn clear across the floor, with boxes and ribbons and bows and more. It looked like the world’s kind of Christmas to me and less like the one I thought Christmas should be. It was early Saturday morning and I was already stressed. 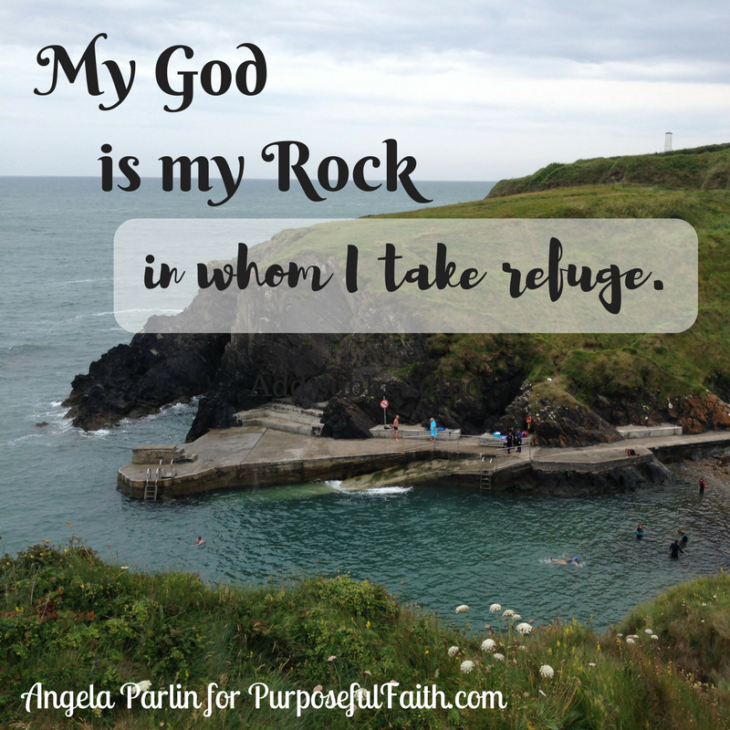 It didn’t help that I neglected my time alone with God. Somehow on this day, my to-do-list which was already a mile long, got a VIP slot on my morning schedule. I had people to shop for, a party to plan, and for sanity’s sake, I needed to clean up the ginormous mess on the floor where I had been wrapping gifts the night before. And, I knew if I got organized I might even find those pesky scissors I was sure were hiding somewhere beneath that pile of gift wrap and tangled ribbon! The whistle on my phone, alerting me to a text, momentarily distracted me from the tasks at hand. The text was from a new friend. I say new, because Sheri had started visiting our life group at church a few months ago. As a group we had been praying for her mother who had been in and out of the hospital for cancer treatments. Other than church, we didn’t communicate. But recently that all changed. She started sending me texts to keep me up-to-date on her mom’s progress, and in the back and forth we forged a friendship. On this particular morning she texted me to let me know her mom had taken a turn for the worse. I had never felt prompted to visit Sheri before, but when I read the text that Saturday, I heard God whisper into my heart, “Go. Go be with her now”. Though, I instinctively knew this whisper was from God, I have to admit I texted Sheri back, asking which hospital her mom was in, half hoping it would be on the other side of the universe so I’d have an excuse to get back to my mile long to-do-list which didn’t include a hospital visit. However, as God would have it, Sheri was close by. Little did I know, God would have my new friend change my Christmas from stressed to a Christmas blessed. I rallied my husband and off we went. We arrived at the hospital room just as another couple were leaving. I was relieved to see Sheri was not alone. We visited for a while, and before we left, David and I prayed for her and her sweet mama. Sheri seemed at peace, and I was glad I had put my to-do-list aside for a while. Later that afternoon, I heard from Sheri again, this time her text gave me goose bumps. “Thank you for coming to the hospital….cool story. Early in the morning, about 1:30, the nurse tried to reposition my mom. It was heartbreaking to see her in so much pain. I left and went to the hospital chapel to pray. I got on my knees and prayed for my mom, and I prayed for God to please not leave me alone. I feared the dark abyss I fell into after my divorce. I slept for about two hours from 2:00-4:00 and was awakened by an audible voice saying, ‘I am here’. I looked around, but no one was there. I wasn’t dreaming, I knew what I heard. About 7:00 a.m. a friend responded to a Facebook post and asked if she could come to the hospital. Then one of my old neighbors came by, then you and David. Later, my friend Harrison from NY called, and then Diane. My heart was full. It was God, He heard my prayer and didn’t leave me to be alone. God was near. God was here. For the 400 years prior to the birth of Christ, God was silent. His people didn’t hear from Him. They felt alone. 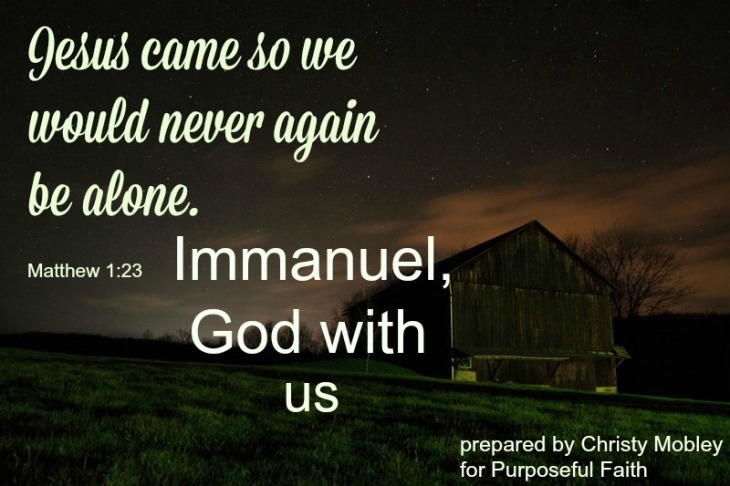 Galatians 4:4 says, ” … when the set time had fully come, God sent his Son…” and Matthew 2:3 says that his son “….will be called Immanuel, God with us.” God sent His son, at just the right time, to be with us so that we would never have to be alone again. 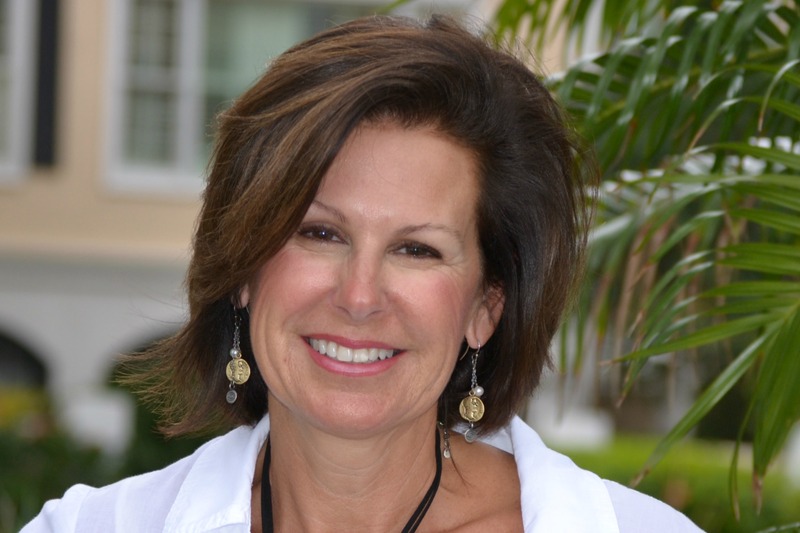 God heard Sheri and was there for her. He heard my longing and was there for me. In allowing me to take part in this Saturday morning miracle, He brought the real reason back into this Christmas season and changed my Christmas mess to a Christmas blessed. At just the right time He blessed us with the gift of His presence. Christmas is not about tinsel and bows, it’s about God sending Jesus to earth’s humble abode. He came so we’d never again be alone. He came so we could one day call heaven our home. ***Get blog posts via email for a chance to win an Amazon Gift Card. Click here!